This is supposed to start shipping in a week or so. 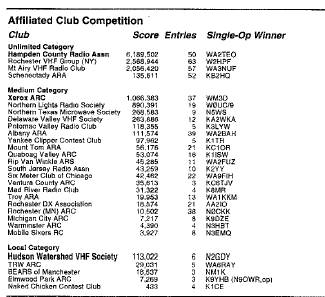 In the late 80s and much of the 90s, the Rochester VHF Group sponsored a local club competition to spur activity in the ARRL January VHF Sweepstakes contest. XARC participated for several years, and won the local club competition several times, including 3 years in a row, finally retiring the “Rochester Cup” in 1996. Though doing so well in the local club competition was a highlight, maybe the most impressive feat was winning the ARRL Gavel for the Medium Club Category in 1993. Only 3 clubs outscored us in the Unlimited category, placing us fourth in the country. We had 37 participants, and likely the most serious of our VHF/UHF active members gave their scores to the Rochester VHF Group. The Kenwood TS-890 is now for sale. Here is a recent YouTube video by a new owner. This radio is a down conversion superhet, with some amazing specs. The bad news is the initial price is over $4K. But it out performs many more expensive radios, at least in close-in dynamic range numbers.